Overlooking the marina and the bay Casa Colina has a priviledge location on top of the hill, distinguishing at the Mexican Pacific. With a wide variety of enterteinment and comfort, you will have the privacy and the ideal space to socialize. Their 250° views to the ocean views that Casa Colina has to offer. Casa Colina is a luxurious property of 6 rooms, ideal for 12 to 15 guests , with a contemporary design using mexican and beach elements as part of the decoration creating more intimate and cozy spaces. The three levels of the Villa are designed and distributed in such way that the rooms have all the privacy and quiet required. At each level you will be connected by a lobby, each one offers different ambiences and additional relaxation spaces. Their pre-stocking service will enhance your retreat by allowing you a much more relaxing arrival, you will be able to choose the products and brands of your preference, in case they are not found the Villa will acquire substitutes. All the products are bought locally and they are charge at their cost. For the cuisine lovers you will certainly enjoy to share the kitchen with the Chef and get to know some of his secrets. Each one of the six rooms are decorated individually and they have their own characteristics that will make the tailored made for a special guest at your party. All rooms offer spectacular views, they have wide closets and L'Occitane amenities. The infinity pool and jacuzzi are the hot spot to enjoy a barbecue and the cocktails of your preference prepared by the Chef and your personal waiter. If you have a daily fitness rutine that you don't want to leve aside, Casa Colina offers you a Fitness center with a great view to the lagoon, flat screen TV with Sky. Lights in the evening transform the Villa, it is like two different atmospheres form day to night. Manteining soft and relaxing spaces. Their concierge will be glad to orginize for you massage or facial services, mani - pedi within the comfort of the Villa in the area of your preference. Tee times, tennis, aquatic sports, horseback riding, a tour by Colima´s Volcano or visiting surrounding towns it will be a pleassure to aasist you. Isla Navidad and Barra de Navidad adittionally offer an important variety of restaurants that you may visit during your stay. The best is that you won't have to worry for anything, it will be like your beach property with the advantage of having the service and the attention to pamper you with no troubles. The freedom and the flexibility that this kind of retreat can offer. Special events, family reunion, magical weddings, corporate retreats, gilrfriends getaway you will certainly find the perfect excuse to stay. Great for the passionate Golfer , as Casa Colina is just a few steps from a great 27 hole Golf course. Parking capacity for 3 cars. Gym with: free weights, assisted weight and resistance machines, treadmills, ellipticals, exercise balls and stretching areas. The Villa is equipped with i Home in each one of its rooms, TV room with flat scren nof 65", SKY, DVD and Bose Home theater. Aditionally it has 2 barbecues, one in the palapa and another one in the pool area. Electric golf cart, which can be used within the complex of Isla Navidad. Note: Rates are quoted in pesos and are subject to change without notice. Please note that vilas will charge in Mexican pesos at current exchange rate when payment is processed. A deposit of the 50% of the total stay is required to guarantee the reservation. The remaining 50% will be charge at the arrival day. Up to one week before the arrival of the guests there is no charge. For cancellations, with one week or less to the arrival date there is a charge of teh 25% of the total stay. Rates include roundtrip transportation form Manzanillo airport, staff (chef, waiter, concierge and housekeeping), laundry. Rates do not include 19% taxes or service charge. Rates do not include meals, beverages or phone charges. The Villa offers complimentary roundtrip transportation from Manzanillo's airport for up to 4 passengers. 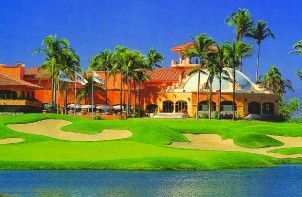 The Golf course Isla Navidad of 27 holes, has been awarded with the "Golf Medal Award", provided by the Golf Magazine and it was recognized as "Mexico's Leading Golf Resort 2012" by World Travel Awards. Designed by the architec Robert Von Hagge, taking advantage of the hills and its vegetation, teh fresh water lagoons and the wide beach creating a one of a king beautiful landscape, providing not only a great golf play but a sensorial experience. The three courses of 9 holes each one: Ocean, Mountain and Lagoosn have the same character however they are very different one from each other, makig them a great challenge for all players.